Many thanks to UP & RUNNING who provided the race numbers for all the Bunny Runs. Full results. This series has been the most successful since the Bunnies began way back in 1992, with more runners than ever from all walks of life and abilities, the young, the old, the fit, the not so fit, the fast, the not so fast - the Bunnies welcome everyone - it's the taking part that counts, That's why 285 of you turned up on yet another glorious evening. First to do battle were Pulse Radio presenters, Becky Holmes and Alex Duffy, who were given a minute's head start. But fastest off the mark and fleetest of foot was 15 year old Jack Thorp to win the Egg Stage in 3-25, and Ian Nixon won his first ever Bunny in 15-39. Three records tumbled in the male categories, William Smith improved the BU14 record. V70 Peter Covey improved his own record to 21-12 while V60 Brian Parkinson took 18 seconds off his record. Katie Walshaw didn't disappoint and won the Egg Stage for the third time in 4-04 and the race for the third time. Katie along with Tom Adams the mens series winner will feature on the 2011 Bunny Beer bottle label. 13 year old Bo Bo Haywood is fast becoming a force to be reckoned with and duly obliged by rewriting Mel Hyder's FU14 and FU16 records. See you all at the Bunny Run Relay – 7-30pm start – teams of 3, try and get there early so we can process the entries. Full results. The sun keeps shining and the runners just keep on coming with 296 eager Bunny runners not yet fed up with chasing chocolate. Fancy dress bumble bee, Chris Needham, flew away at the start.... but winner of the last two Egg Stage prizes, Tom Adams, gave chase and approaching the Egg Stage sign a fierce 'Eggpic stage sprint' ensued with a frantic race to the post, with Tom narrowly winning by the width of his Ilkley vest in 3-29. 33 year old international Adam Osbourne won his first ever Bunny in 15-26. In his first outing since knee surgery Karl Gray was second overall and first V40. Under 14 Yorkshire Champion, William Smith has certainly hit form taking seven seconds off Max Wharton's week old time finishing ninth overall. Three series winners emerged V50 Steve Oldfield, V60 Brian Parkinson and V70 Peter Covey all won again for the third week. Holmfirth Harriers again supplied the ladies winner with Katie Walshaw winning the Egg Stage again in 4-09 and the race in twenty eighth overall in 17-39. Just like BR2 Bo Bo Haywood finished second and first GU14, and Kath Farquhar finished third and first FV40 with Emma Spencer fourth and first FU16. The Bunnies have even managed to take to air this year with Pulse Radio presenter Becky Holmes taking on the challenge. Next week's race sees overall prizes awarded, with the famous Bunny Beer, which will feature last years series winners Blue Haywood and Ian Holmes. See you all next week for more Bunny Mayhem, remember 7.30pm start!! Paul's photos: Start, Lap 1, and Lap 2. Full results. With all the chocolate associated with these runs they have always been bunnylicious, but now you could add recordific too with a massive 334 all comers, and seven new records being set. 27 year old Tom Adams equalled the record jointly held by Andi Jones and Jack Thompson at 3-23. As usual Mr. Bunny cruised to Bunny victory - his 29th. 25 year old Katie Walshaw took the Bunny by the ears to win the Egg Stage in 4-08 and the race comfortably in 17-53. Last year's FU14 champ, Bo Bo Haywood returned and finished second overall plus first FU14, with FV40 record breaker, Kath Farquhar finishing third, Holly Williams fourth with FU16 Emma Spencer fifth. Two juniors went one step further and ran in fancy dress, Imogen Bristow donned her Tutu whilst Tommy Thorp put on his best bib and tucker, for their efforts they won Easter eggs at the prize giving, where FU14 Issy Wharton won the free guess the winning ladies time Easter egg. See you all next week for more Bunny Mayhem, remember 7-30pm start!! Full results. You'd have thought with the Easter Bunny having just finished his deliveries and hopped into the distance, that runners' addiction for chocolate had been well and truly satisfied. How wrong could you be, because a record 313 of you toed the start line for the first Bunny eggstravaganza of the series. Ian Holmes delivered again, winning his 28th Bunny Run! But he didn't have it all his own way as Ilkley Harrier Tom Adams scampered to the Egg Stage in 3:31. Two cracking U14 runners made the top ten with James Hall finishing sixth and Max Wharton ninth, before Steve Oldfield romped across the line to set a new V50 record. But the biggest record breaker was Peter Covey of Bingley Harriers who smashed the V70 record. Helen Glover finally won a Bunny Run outright in 19:08, with Sally Morley second and Kath Farquhar third. Ilkley Harrier Sally did lead her girls to the team chocolate eggs with Kelly Harrison and Alison Bennett. In sixth overall Gill Myers set a new FV50 record and chasing her home was first FU16 Emma Spencer and first FU14 was Harmonie Waterman. Emma an England junior international had earlier in the race displayed a great turn of speed to win the Egg Stage in 4:19. See you all next week, remember 7:15pm start!! They're here, they're eggciting, they're bunnylicious, they're testing, they're what you've been waiting for all winter, the Bunny Runs spring to life on Tuesday 6th April 2010, with a chocolate prize list even a chocoholic would have problems coping with! Individual Bunny Runs: CS. 3m/300'. £2 on night only. Teams free. PM. Over 12. Records: 14.41 J. Thomas 2009; f. 17.20 M. Wilkinson 2007; "Egg Stage" 3.23 A. Jones and J. Thompsom 2009; f. 3.59 M. Wilkinson 2007. Cadbury's Creme Egg for all entries. All prizes Easter eggs. 3 races out of 4 to count for overall awards. When you enter, guess that night's winning times for a chance to win a free mystery oval chocolate prize! The fun continues with the NEW Fancy Dress Competition with super prizes, judged on the Start line! Getting serious, the 'Egg Stage', is the fast and furious Hare's dash round the small loop, winning it will bring fame and extra chocolate for the first man and lady past the bunny sign. All runners will be entered into a free prize draw, with a choice of a set of flashing teeth, an Easter Egg, or box of chocolates. The Bunnies are renowned for post race fun – free soup and roll in the Old Sun Hotel, race video of that night's event, stacks and stacks of Easter Eggs in the extensive prize list, watch in awe as the first man, lady and vet stagger under the sheer weight of goodies, then the finale the famous chocolate throw out. 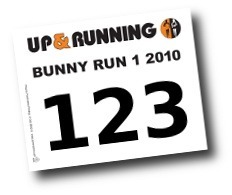 Many thanks to UP & RUNNING who are providing the race numbers for all the Bunny Runs. There's space on the back for emergency details, PLUS a 10% off voucher - just take your race number into one of the U&R shops listed.